As Celtics fans, we love to look back at the dominant 2008 championship team or the 2010 Finals run that maybe would have resulted in banner 18 if Kendrick Perkins were available for game seven. Today I’d like to look back on a Celtics team that defied odds and accomplished more than anyone anticipated. 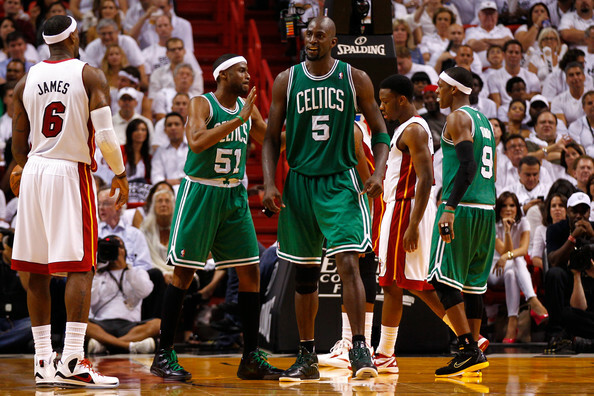 In what was the final year of the Big Three Era, this team summed up everything that made us proud to be C’s fans during those five years. When KG and Ray Allen were acquired in that unforgettable summer of 2007, most sports media members were giving the Celtics a three year window to win a championship due to the age of their superstars. They won it all in their first season together and had a chance to do so again in their third. By the time the 2011-2012 season rolled around, they were on year five. The window was supposed to have closed two years ago, and no one was giving the C’s much of a chance to make another deep playoff run. They had been bounced by the Heat in the second round in just five games in 2011 and it looked like LeBron and crew were the new kings of the Eastern Conference. One of the interesting things about the 2011-2012 Celtics season was that we weren’t even sure if it was going to happen at first. The 2011 NBA lockout began on July 1st and it wasn’t until December 8th that we knew there would be basketball. The season was shortened to 66 games and didn’t begin until Christmas. Although it was short, the Celtics’ regular season featured a lot of ups and downs. The C’s came out slow and gave us no indication that we were in for a memorable season. They started off 0-3 after losses in New York, Miami, and New Orleans. They managed to win their next four before dropping six of seven to fall to 5-9. After that skid, they showed us that they still had a little life in them by winning nine out of 10 to improve to 14-10. Then just when things were getting good, they dropped seven out of eight to drop back below .500. Sitting at 15-17 in late February with just two months before the playoffs, it seemed like the critics might be right. The Celtics just didn’t have enough left in the tank to make another push for banner 18. That’s when the winning started. A 24-10 record the rest of the way brought them to 39-27 and put them at the four seed in the East behind Chicago (1), Miami (2), and Indiana (3), resulting in a first round match-up with the fifth seeded Atlanta Hawks. Next came the match-up we were all waiting for and one of the most thrilling series’ I’ve ever witnessed. It was also one of the most rigged series’ in the history of the NBA because the league was on an all-out mission to get their poster boy LeBron his first ring. The reason I say that the refs may have determined the outcome of this series is because the Celtics went on to win the next three games after having game two ripped out of their hands. If I’m not mistaken, that would have been four straight wins to close out the series if things went the way they should have in game two. Obviously you could make the argument that the Heat would have approached next couple games with more energy if had they lost one at home, but you get what I’m saying. In game three the C’s were led by Garnett with 24 points and 11 rebounds, Rondo with 21 points and 10 assists, and Pierce with 23 points. They cruised to a 101-91 win in Boston. Game five was the best game of the series if you’re a Celtics fan. It was one thing to get a couple wins at home, but to come back to Miami after being robbed there in game two and steal a win was huge. As much as we’d like to forget, we all remember LeBron’s 45 point performance at the Garden to force a game seven. And as much as I dislike Bron Bron, that may have been the best performance of his career in a must-win game. Of course there may not have even been a game six if the refs didn’t hand the Heat game two in Miami but that’s neither here nor there. Sure enough it was the end of the Big Three, as Ray Allen decided to jump ship and join the enemy, which was absolutely unfathomable after the seven game series that had just taken place. A lot of Celtics fans still haven’t forgiven him, and I’m definitely one of them. 2012 was the last time the Celtics made a deep playoff run and contended for a title. Since then they haven’t made it past the first round. Pierce and KG held down the fort for one more year in 2012-2013 but the Celtics only managed to finish a game over .500 before being bounced in the first round by the Knicks. The 2008 Championship was amazing, but it was the later years of the Big Three era that really made me appreciate those guys and their never die attitude. Even when they grew old and slow, they refused to go down without a fight. We never saw that more than we did in 2012. Next NBA Draft Lottery Recap: Where Do The Celtics Go From Here?